Multi-layered complex architecture makes it tough to isolate defects. Agility – Enabling faster change leads to increase in integration and regression testing. Integrated Systems – More points of failure result in more defects. More Reusability – More problems in security and performance. Managing people across geographies in disparate teams. 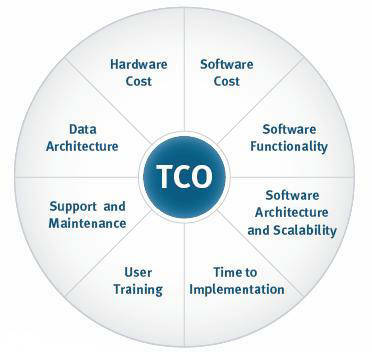 Heterogeneous technologies – Expensive to test, and manage a wide variety of systems. Testing processes that span across multiple systems create complex test data needs. SOA has a unique architectural ecology. • Can classical tools test non-UI components? • Can these tools cope up with subscriptions to brokers? • Can they interpret messages that flow across an ESB? SOA has its own set of unique protocols. • Can the current automation tools handle protocols such as SOAP, WS-Security etc.? • Can classical tools take you through a web of component invocations for defect isolation? • A new architecture brings the need for a new approach. Current black-box lifecycle processes and tools cannot cope with the sudden need for deep grey box testing. For example, we need to test the UI and the components behind it. • SOA lifecycles are agile and iterative. This in turn increases the importance of automated regression testing. How does one enable continuous integration testing where manual testing is impossible and classical tools do not work? • Can current tools handle orchestration of multiple tools that span across technologies? For example: UI automation, middle ware testing, service testing and database querying. • End-to-end process testing can create some complex TDM requirements that non-SOA monolithic systems would not require. • Per – use SaaS (Software as a Service) systems can drive up the cost of regression testing. • Some systems such as mainframes may not be easily available or accessible for testing. – Reuse, redesign, and replacement of test component parts (SOAPUI scripts) is very difficult in SOA testing when dealing with multiple technologies and standards like HL7V2 MLLP, HL7 V3 Layered design, IHE – XDS, SOAP, SAML and many other technologies and protocols used when accessing IF – HIAL. – Loosely coupled collections of data and functions residing on multiple internal or external machines. The large set of technologies as mentioned before and the loosely coupled collection of data will define and render each test environment as unique. For instance the Development DIT and Functional testing environment ITE1 (aka FIT) are going to be different due to the large number of databases, servers and code versions deployed in the specific environments. – The advantage of the reusable artifacts (services) that are accessed through well-defined, platform independent, interfaces named contracts (WSDL) are true only for the final product running in the Production environment and does comply with the business specifications mentioned in the contract. In the lower stages of the software development and testing life cycle the contract is not enforced and varies significantly from one environment to another. – Because SOA applications are composed of loosely coupled, business-level services, distributed over a network, we must test the application from the following perspectives: end-to-end, service-by-service and interface-by-interface. There is no magical bullet that targets all the functions in one shot. – We need to trust SOA services in the following areas, but we may not control the following testing that can’t be automated. Functionality which includes API – Application Programming Interface and Interoperability plus Integration. Also Publishing, Finding and Data Binding, Security and Performance are difficult if not impossible to automate. – The overall functionality of SOA applications should be easier to test. That is true only if we, or someone we trust, thoroughly test the application’s components (services) before we assemble them together to create the application. 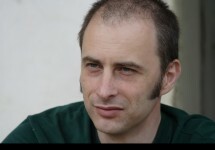 Having said that, starting with lower-defect components typically means a smoother testing process but SOA applications generally have an increased number of: APIs (one for each service), communication paths between those services, there is now an increased level of integration and interoperability testing that must be performed. Considering all these aspects who is responsible for this testing? The service provider? The service requester? Both? Someone else? How do we establish trust? Big SOA requires organizations to scale adoption across multiple consumers by establishing a shared understanding of business and technical domains. Each service is part of a bigger picture, and a well-designed service plugs into existing business processes and supports defined business requirements. Effective service adoption within an enterprise require significant planning, coordination, and governance. Organizations must be cautious not to let a Big SOA initiative fail due to analysis paralysis or inter-enterprise feudal fiefdoms. Big SOA initiatives focus on enterprise governance processes, enterprise-wide re-use, and portfolio consolidation. Achieving these big goals requires structurally changing design-time processes and overcoming significant cultural bias that lead to inhibiting design, accounting, control, and operational ramifications. Traditional Big SOA initiatives can succeed, but only if top-level organizational support (e.g. C-level) overcomes organizational inertia and project teams bridge silos and operate as one team. 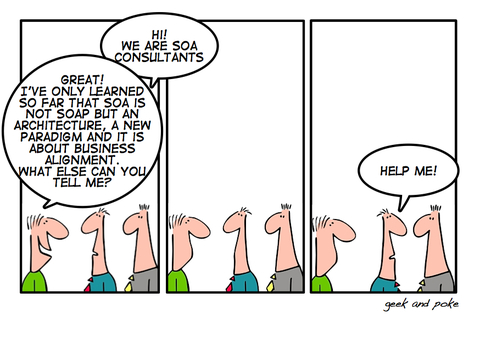 When tackling Big SOA, teams need to find an effective entry point. Some teams start with an IT-driven initiative or slipstream on important business-driven transformation initiatives. An IT-driven Big SOA approach can be very effective when focusing on building shared infrastructure services, such as security, identity, auditing, monitoring, and cloud management. These efforts can deliver rapid returns on investment, and they don’t require extensive collaboration with the business units for success. On the other hand, this approach delays engaging the business and may provide minimal return on investment (ROI) recognition unless incorporated into more visible risk management, cyber-security, or customer experience initiatives. A business-driven Big SOA approach is often triggered by a top-down imperative to redesign business processes and/or the customer experience. By design, these business transformation efforts must be highly coordinated across IT and the various business units. When considering pursuing Big SOA, slipstream service portfolio investment behind funded business projects. Many teams embarking on SOA do not have the authority, span of control, or influence to implement required Big SOA activities. With Big SOA success unobtainable in many organizations, team members who want to ‘do SOA’ and demonstrate business value often focus on small SOA. A Small SOA approach implements SOA principles on a project-by-project basis. This approach incurs less risk, but produces a smaller return. Typically there’s limited coordination across projects, and Small SOA doesn’t require as much cultural and political unrest. Using this process, the organization can slowly build a portfolio of services, but with limited coordination, the services are less likely to be reusable. Small SOA initiatives often focus on run-time environment concerns instead of design-time concerns. Popular run-time environment concerns include enabling flexible communication styles, interaction patterns, and mediation mechanisms that facilitate integration and promote loose coupling. Example communication styles include synchronous, asynchronous, one-way, and request response messaging. Commonly supported interaction patterns include peer-to-peer, brokered delivery, hub-and-spoke, publish/subscribe, and orchestrated workflow, which are used to bridge the gap between consumer-provider availability, reliability, and topology. Mediation mechanisms reduce the need to provide symmetric messaging platforms where both consumer and provider communicate using the same protocol, message format, and communication style. Mediation mechanisms also encapsulate implementation details related to location, versioning, and identity domain. Adopting an IT-driven Small SOA approach requires a cautious approach to not let the effort focus exclusively on technology rather than design, culture, and IT goals. Successful IT-driven Small SOA teams promote consumer adoption stories, track service subscribers, and publicize usage growth. A business-driven Small SOA approach can result in compelling singular success stories, which will encourage SOA adoption. However, business asset re-use is doubtful without cross-team collaboration and promotion. Uncoordinated and ungoverned project-by-project efforts can generate a chaotic situation resulting in little or no reuse. How many of your services are shared, and how many services simply facilitate point-to-point integration?